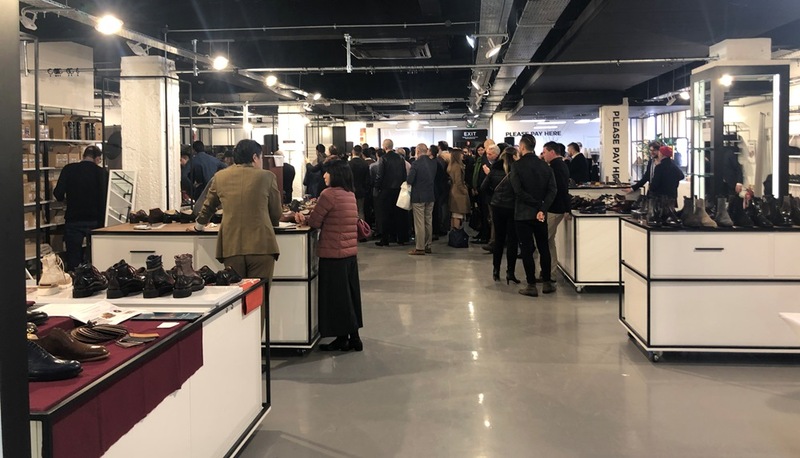 Every year, people with a passion for classic shoes flock from all over the world to visit the London Super Trunk Show. A biannual event taking place during Spring but also in Stockholm during Autumn. With a phenomenal cast that includes Carmina, Gaziano & Girling and Norman Vilalta among others, it is a fantastic experience worthy of your time. Misiu Academy had once more the pleasure of attending the event. 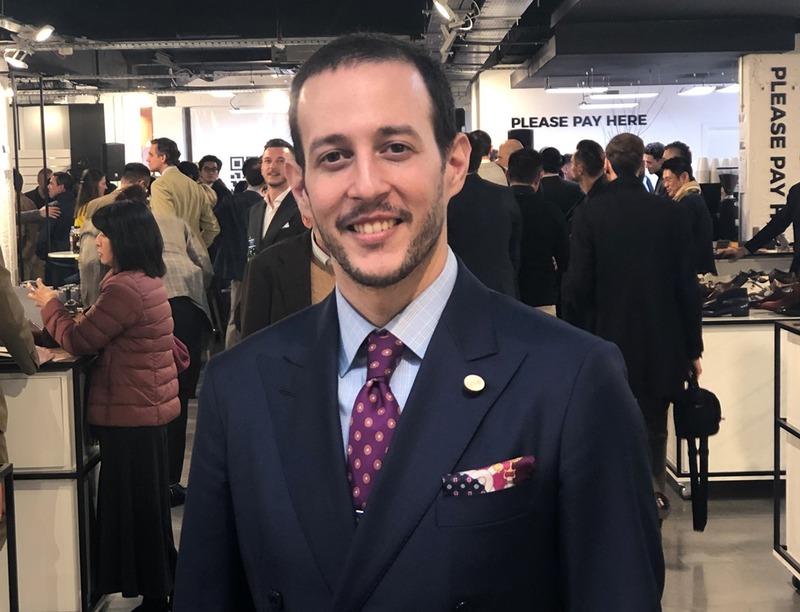 This is a full report of the breathtaking event that took place on the 23rd of March 2019. Curious about the Stockholm event? Read our 2018 Report here! 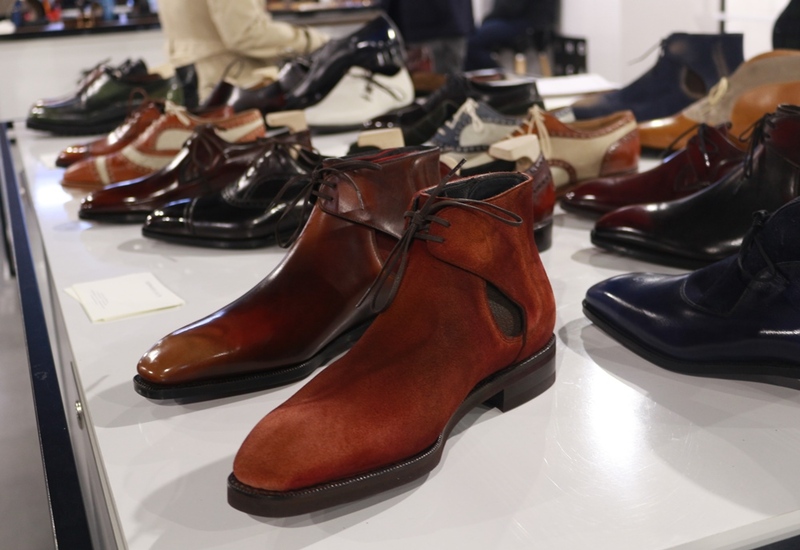 The London Super Trunk Show is the child of Jesper Ingevaldsson and Justin Fitzpatrick. The first is the owner of the popular Shoegazing Blog while the latter runs Theshoesnobb Blog and J.Fitzpatrick Footwear. Initially hosted in various places in Stockholm, Justin and Jesper wanted to take it to the next level and create a global event in London. It all came in fruition in 2017 and was an overwhelming success, which is no surprise. This is the third version of the iconic event and was bigger and better than ever. In this year’s edition, the venue of choice was the legendary Regent Street right next to Piccadilly Circus. Within walking distance of Soho and Saville Row, it is a lively hub full of people and life. The host was Showcase.co which is a private exhibition for exclusive sample sales and luxury fashion events. It is very spacious and the room was never so crowded that you could not move or breathe. However, the room has very strong artificial light, which has a big impact on shoe photography. You would need a really professional kit to get around this. Some of the exhibitors had a bigger problem, such as Gaziano & Girling. What was fantastic though was the staff. Absolutely lovely, lively people buzzing around and being extremely nice and friendly. The bartender was awesome and the social media manager of Showcase.co was someone I would gladly hang out with. Let’s take a quick closer look at all three of them shall we? 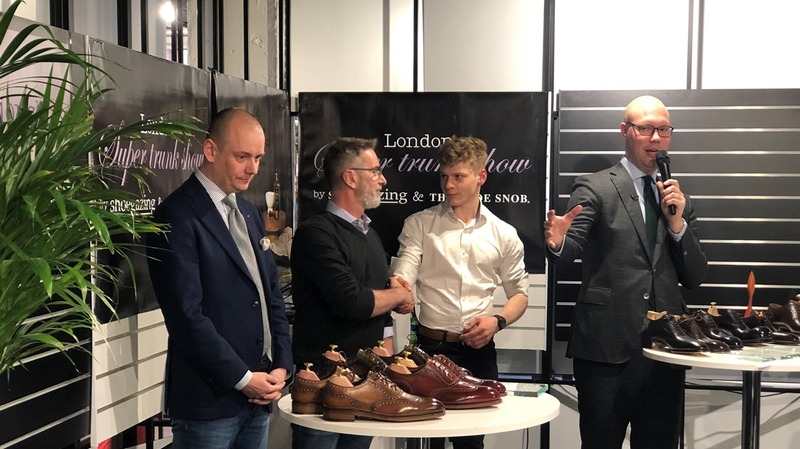 A new introduction in the London Super Trunk Show 2019 was the Shoe Patina Contest. 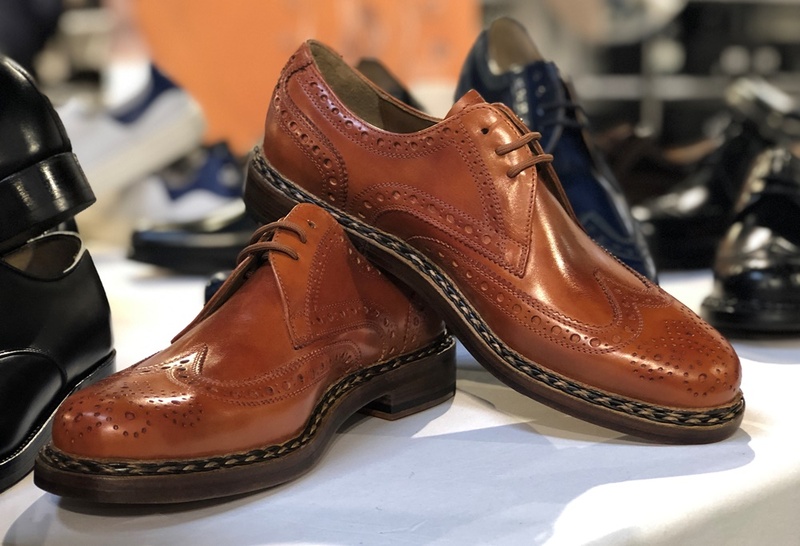 After a lengthy qualification period, the three finalists had 5 hours to create the best possible patina on a TLB Mallorca Adelaide Wingtip Shoe with crust leather coming from the Annonay Tannery. It is a collaboration with Saphir and the winner gets to keep their shoe and display it in 10 different destinations around the world. The winner was Stéphane Villette who was probably my favorite due to his color choice. A stunning green patina with hues of brown. The other two did a fantastic job as well. Samuel is a young lad working for Gaziano & Girling while Andrzej runs TheShine, a popular store in Poland. The latter did not look happy to lose. Understandable after 5 hours of painting! 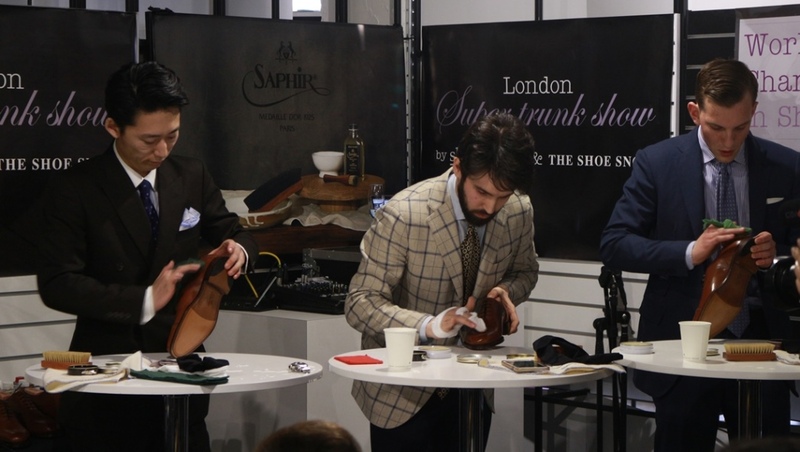 A recurring event in the London Super Trunk Show is the Shoe Shining competition. The qualification system is a little sketchy, since contestants need to submit pictures but it works quite well so far. The finalists get 20 minutes to shine a pair of Loake 1880 Aldwych in Mahogany as best as possible. Among the judges were Jesper Ingevaldsson, Justin Fitzpatrick and Kirby Allison (The Hanger Project). The winner for this year is Yuta Sugimura and it is absolutely amazing what they can do in just 20 minutes. Sometimes you have to struggle for hours to create a good shine. Honestly, all contestants were amazing and for the common eye it is very hard to make an accurate judgement. Last but not least, the Master Shoemaking competition. With a prize pool of £6000 (€6,800 /$7,700), the contestants need to make a shoe that adheres to each year’s rules. 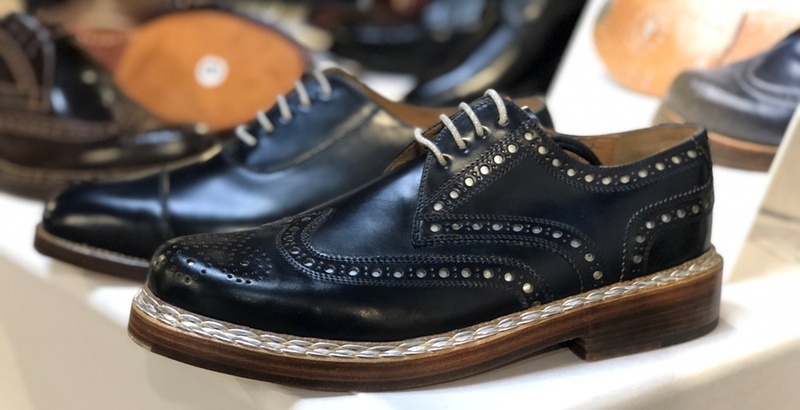 In the London Super Trunk Show 2019 the model was a dark brown full brogue oxford with a single leather sole, hand welted with a handmade sole stitch. In the end, 10 shoes are chosen and a reverse countdown starts before announcing the winner. The shoes have a number and the judges don’t know who is who until the end. Some absolutely incredible designs and innovative soles and heels. 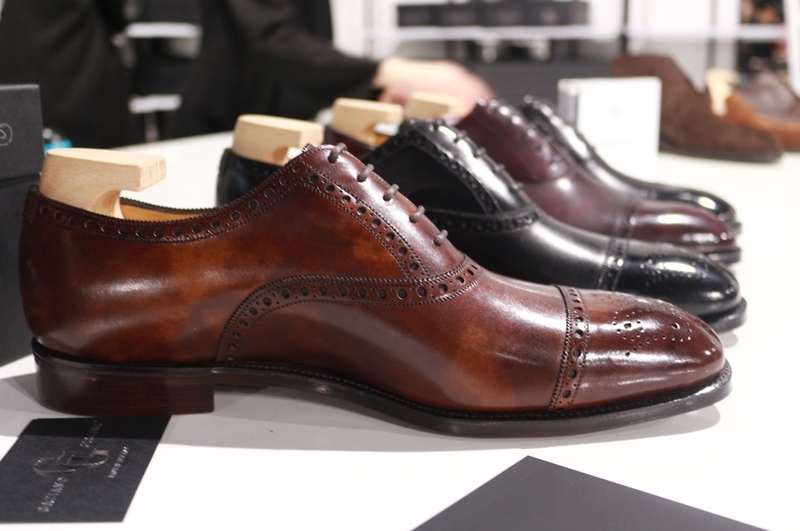 These shoes however are just for display and to show craftsmanship. The big winner of this year is fellow Swede Daniel Wegan.. His design was astonishing, with the heel resembling a horseshoe. 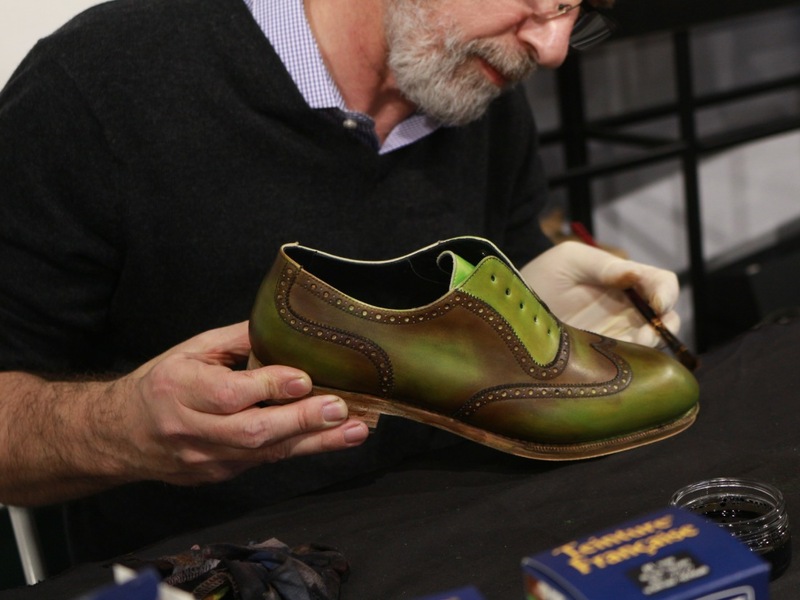 He is one of the best bespoke shoemakers in the world and works for Gaziano & Girling. In second place Christophe Corthay (who also seems to love Legos), while third was Eiji Murata from Japan. Initially, Altan Bottier was supposed to exhibit as well, however strikes in France prevented them from flying. What a shame, I really wanted to meet them and look at their shoes. They are after all in my list for the Best Shoes between 400-700$! I finally got to meet Bojan from Zeb Shoes who also is on the same list. He will get his own bonus section since it is worth it! I will cover every exhibitor separately apart from the Japanese ones. Unfortunately, with the exception of Kiton Boots, I was not sure who is who. I will go into detail later. One of my first stops after entering the venue was Carmina. Everybody in the Goodyear Welted World knows the legendary shoemaker from Mallorca. Dating as back as 1866, they have been creating shoes of the highest quality. It was a pleasure meeting them formally for the first time and I had a chance to try the popular Rain last. It was TTS (True-To-Size) and a great comfortable fit for a RTW Shoe. Most of my talks where with Sara and Miquel, a part of the Carmina Marketing Team. Super friendly and talkative and continue the great experience I have had with people from the Iberian Peninsula. When it comes to shoes, Carmina has it all. 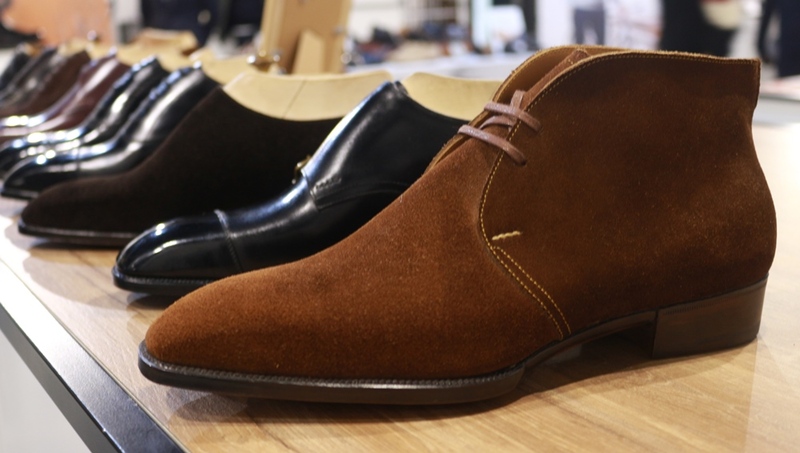 From expensive state of the art exotic leather boots, to classic oxfords and unlined suede Chukkas. One of the advantages is their flexible and famous MTO program, especially for Cordovan Shoes. If you are lucky to attend a Trunk Show, the additional MTO Fee is usually waived which a substantial discount. You get a lot of shoe for the money with great craftsmanship and quality leather. Designs with Mediterranean flair, tight waists and competitive pricing makes Carmina a Brand you will not regret buying from. Highly recommended. 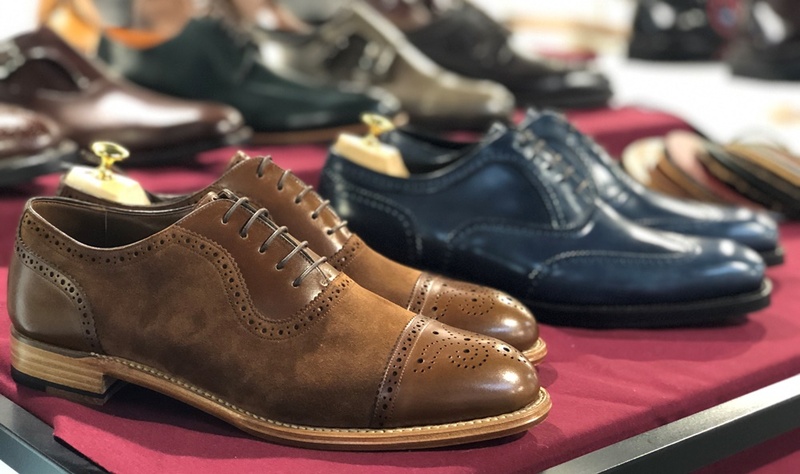 Onto probably the most expensive retail shoes in the venue, Gaziano & Girling is a rather new company established in 2006 by Tony Gaziano & Dean Girling. 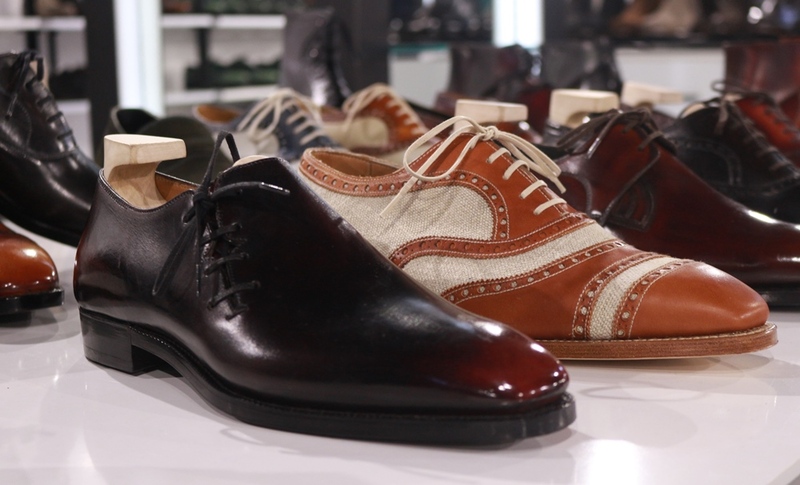 Since then, it has been synonymous with the highest quality for bespoke shoes. They do have however some RTW models and a newly released classic line. I wish the light was a little better! The designs are amazing, unique and can veer away from classic British style. A lot of the features in their RTW line are not often seen outside the bespoke world. 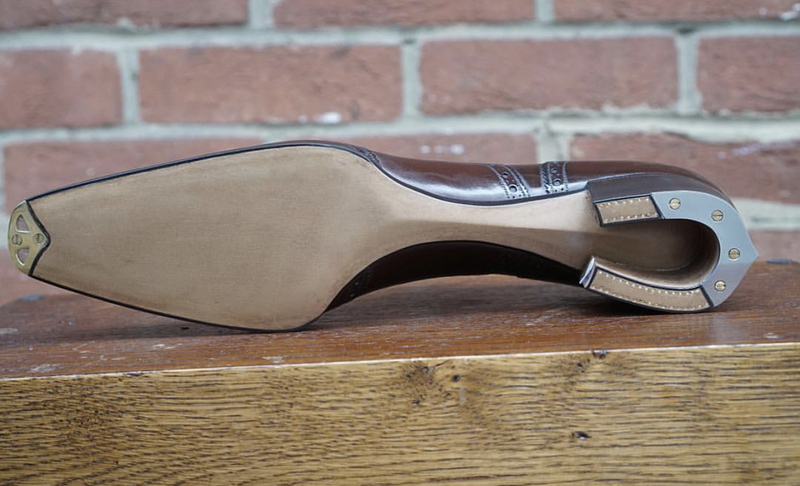 These include closed sole channel stitching, beveled and fiddleback waists with a full welt. 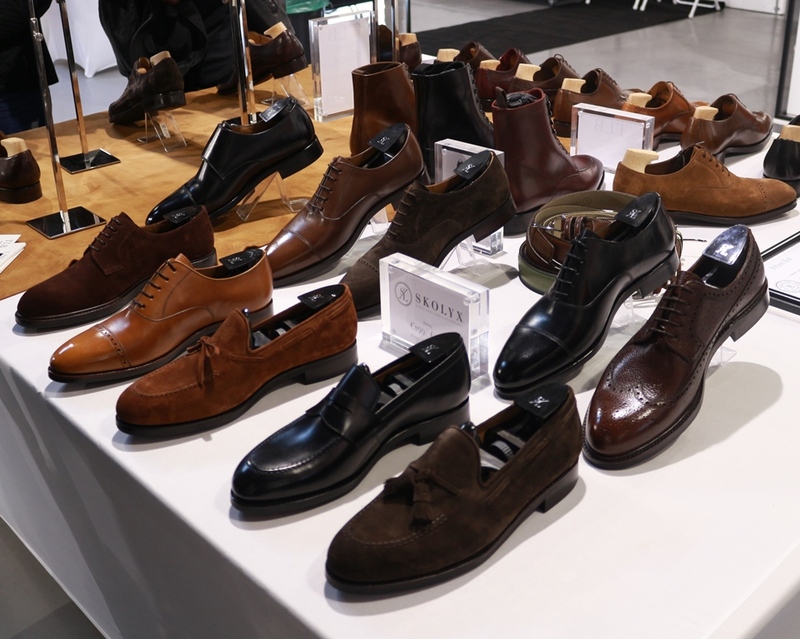 Their booth suffered from very strong artificial light, making the shoes look too glossy and dull at times. 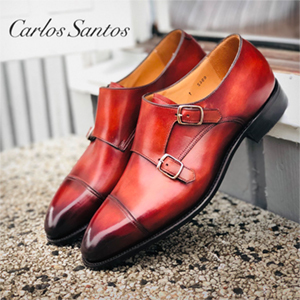 Gaziano & Girling Shoes are the true endgame for those that love shoes and can afford the steep price. The new classic range is a little more affordable just south of $1000 but can well exceed that price. 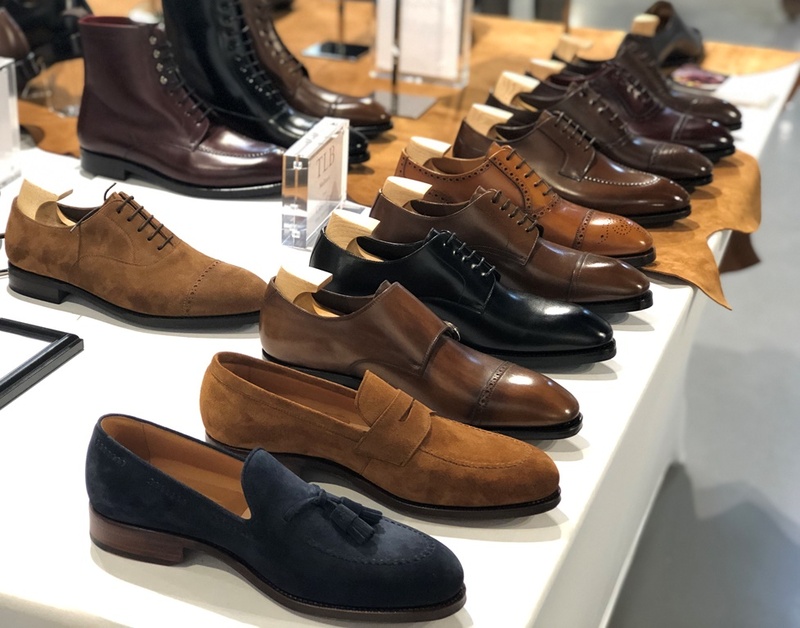 Justin Fitzpatrick not only runs his own shoe blog and is a co-founder of the London Super Trunk Show but also runs a successful shoe company bearing his own name. An apprentice to the late Stefano Bemer, Justin had such a passion for shoes and determination to leave his mark. He has a great selection of shoes and almost all of them have a unique element to them. 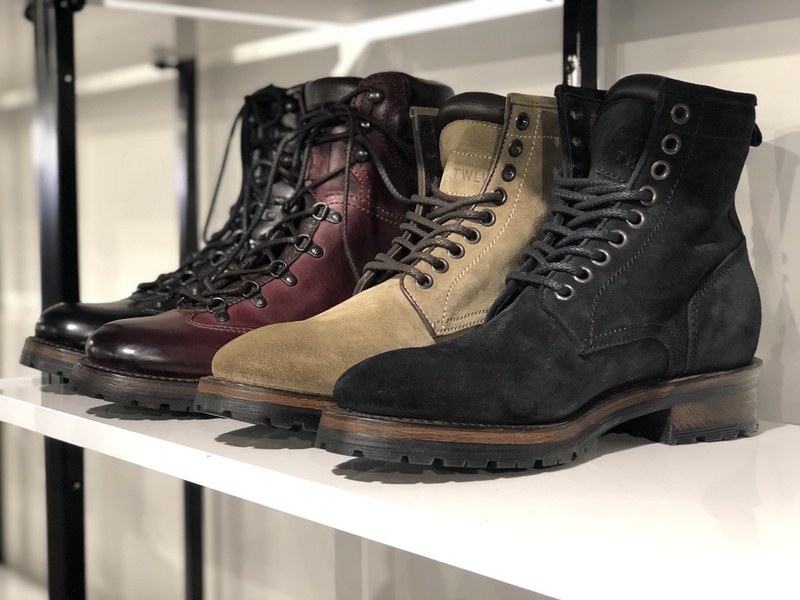 If you are looking for something different, such as button boots or shoes with a blend of different materials, it is hard to find something elsewhere below $500. Justin himself is also such a nice everyday guy. He was dressed in normal everyday clothes and a quilted vest and was more than happy to talk to me. The same goes for two of his assistants there. I thank them so much for the effort they put into making this. Nice lasts, good leather and a decent price make it a good choice, especially for the younger crowd. 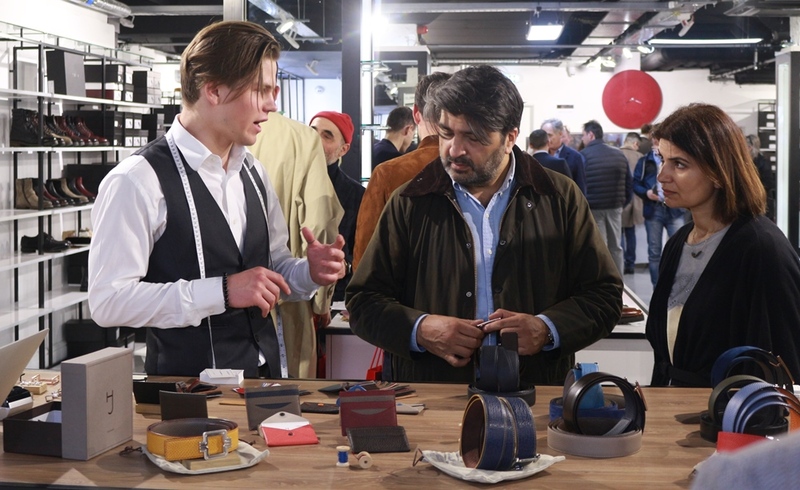 A Swiss Brand with French roots, J.Hopenstand is a family company making made to measure and bespoke belts and leather goods. I did not spend much time there, but the owner was friendly and answered all my questions. You can buy from double-sided belts to card holders, belt buckles and even envelopes. The prices are not for your everyday man. 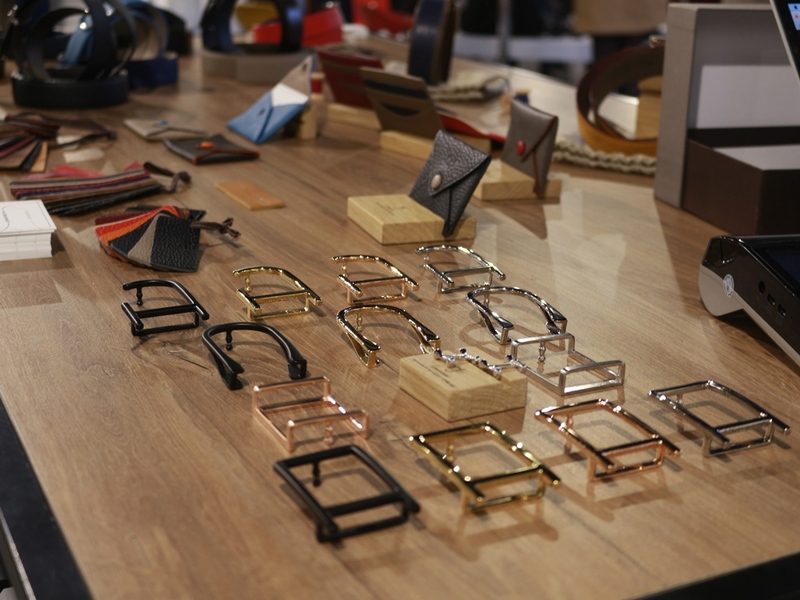 Their MTM belts cost 250 Euros (£215/$280) and the bespoke versions a staggering 600 Euros (£515/$675). No matter the craftsmanship and detail, I cannot justify spending so much money on a belt. I am a big fan after all of side adjusters. I find it very hard to recommend it to someone for that price. 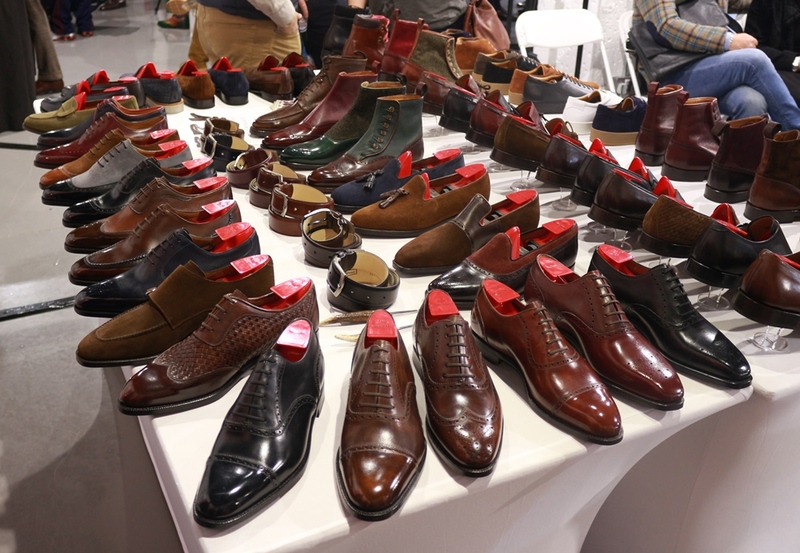 The Japan Shoes Export Platform (JSEP) is Japans foray in the European Market. Japanese shoes have seen a surge in popularity mainly because of their immaculate design and attention to detail. In general, the problem is twofold. They are extremely expensive and communication is an issue due to the language barrier. JSEP consists of Oriental/Matsumoto, Miyagi Kogyo, and Kiten who I met in last year’s event. 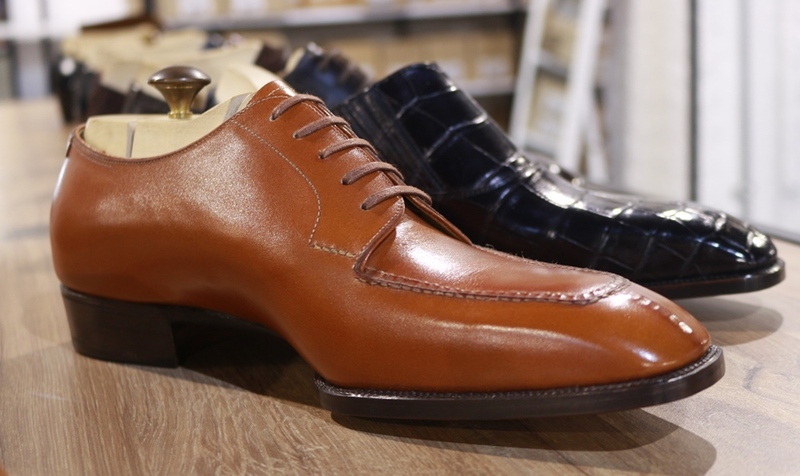 Then there is Bolero, a Bespoke Shoemaker that now offers Made To Order shoes at bespoke standards. The difference is that the last is not fully custom. The prices are not for the common mortals however! Got £1,700 ($2250/€1,900) to spare? Kiten makes very interesting unique Boots, unlike anything you see. It is the cheapest from them all and has a bologna construction with a rubber sole cemented under the welt. Retail price is about £265 ($350/€300). The construction makes them great for rougher weather and are definitely more casual. 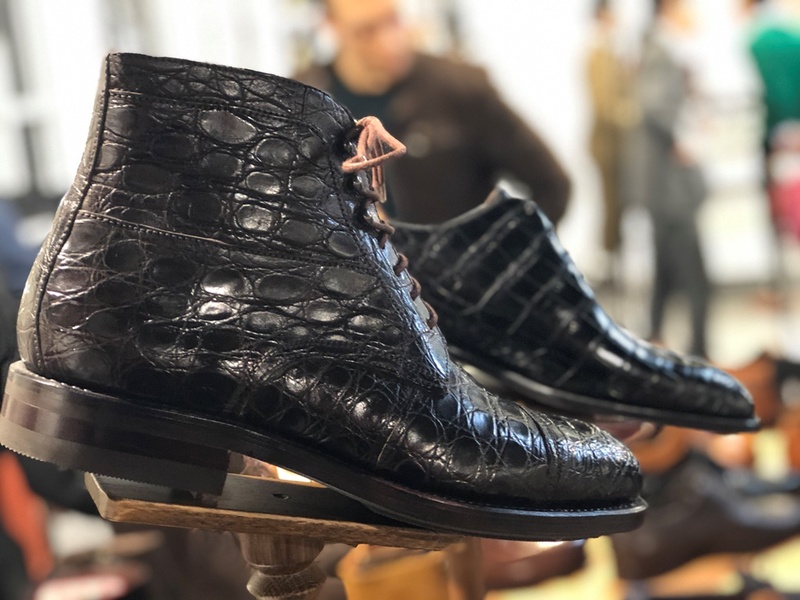 As for the last two, Miyagi Kogyo (£415/$550/€470)makes more traditional shoes that resemble Edward Green while Oriental/Matsumoto are slightly more expensive (£530/$700/€600). Back to the biggest issue here, communication. While all the Japanese representatives are extremely friendly as per Japanese culture, it is very hard talking to them in detail and finding information online. Their websites are shockingly bad and basic. I would dread ordering only to receive the wrong size. It was very hard to distinguish who was who however. Bolero had a sign and I was familiar with Kiton Boots, but the other two were a mystery. The shoes are of the absolute highest quality however with extreme attention to detail. The stitching is so tight and even fiddleback waists have a full 270 degree welt. If you have wide feet however, I think you will suffer. What can I say about this man! Casual, everyday man with a red beanie and a smile on his face. Living in Barcelona, Norman Vilalta makes exquisite unique shoes. I learned about him from The Parisian Gentleman and I am very happy to have met him. We had a nice talk about shoes, apprenticeships and life and it was fascinating that his signature looks like a shoe. His bench was a small creative mess, signs of a true artist. 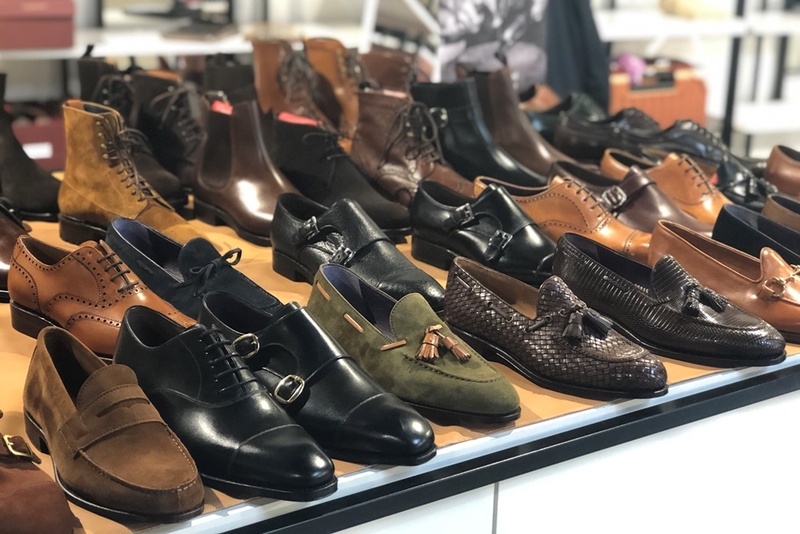 From unique sharp Chelsea Boots, to classic wholecuts with side lacing and scotch grain derbies with a tank for a sole, Norman Vilalta is a way of life. His shoes retail for about $1000 give or take and even more for bespoke versions. They are not for the faint of heart or a beginner though! There is a lack of online reviews that could help him reach out to more people but he is truly excellent. The birth child of a Swede and an Italian, Project TWLV is a rather new company in Gothenburg, Sweden. 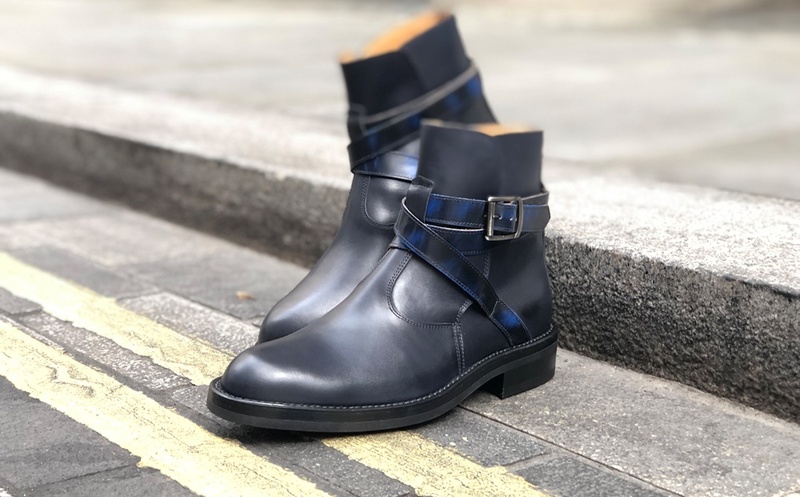 The founders (Henrik Hobik and Antonio Panella) deliver Italian handmade Boots for both men and women in a small selection of contemporary styles. A lack of reviews makes it hard for a new customer to shell out £425 ($560/€480) or double that for Cordovan. Nonetheless, I am happy to report that they are great! Good quality leathers and a big selection. 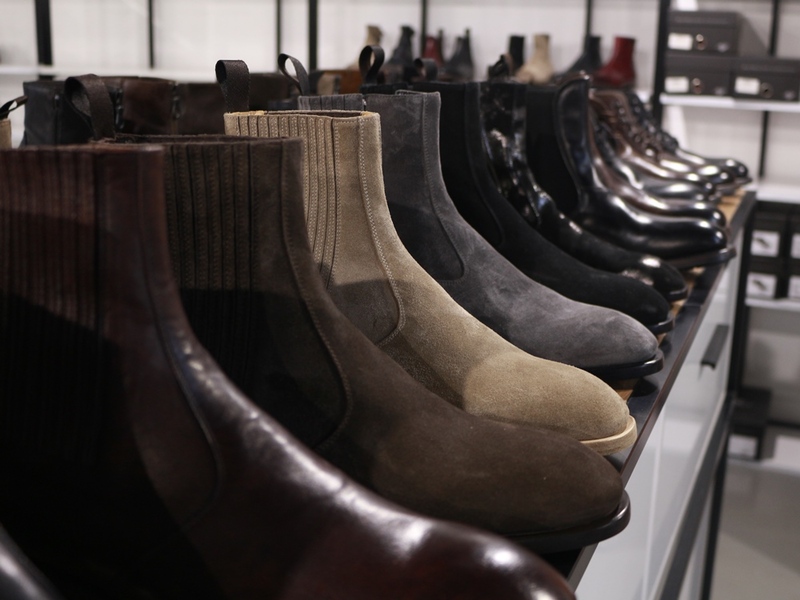 From clean-cut Chelsea Boots to Lace-Up Field Boots, they have a lot to choose from. They are a little more modern too! The main focus is both Rapid and Goodyear Welt Boots with a multitude of leather options. These includes exotics such as python and kangaroo leather for a rather good price. Interestingly enough, the suede versions are their best sellers. I spoke extensively with Henrik and he explained the philosophy behind his Brand. I think they are rather excellent value and with such variety you will surely find something for your lifestyle. Would you be interested in reading a review? Let me know in the comments. Saphir offer some of the best products in Leather Care. 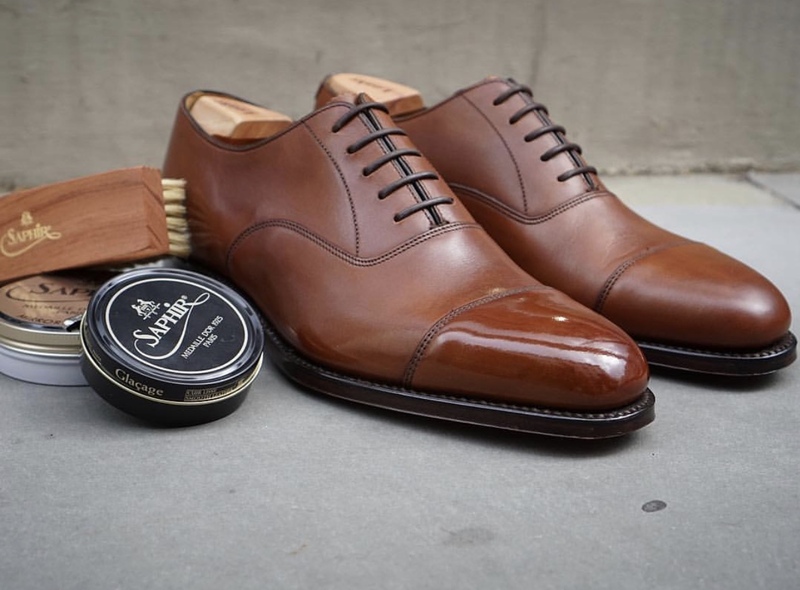 Whether you are looking to buff or change the color of your shoes, create a patina or nourish your leather shoes, it cannot get any better than that. They are proud partners of the London Super Trunk Show and their products are used in many of the world competitions. In this event, they had a nice little booth with a lot of products and very friendly personal. If you find yourself in such a trunk show, it is a fantastic opportunity to ask them for information, tips and a demonstration. 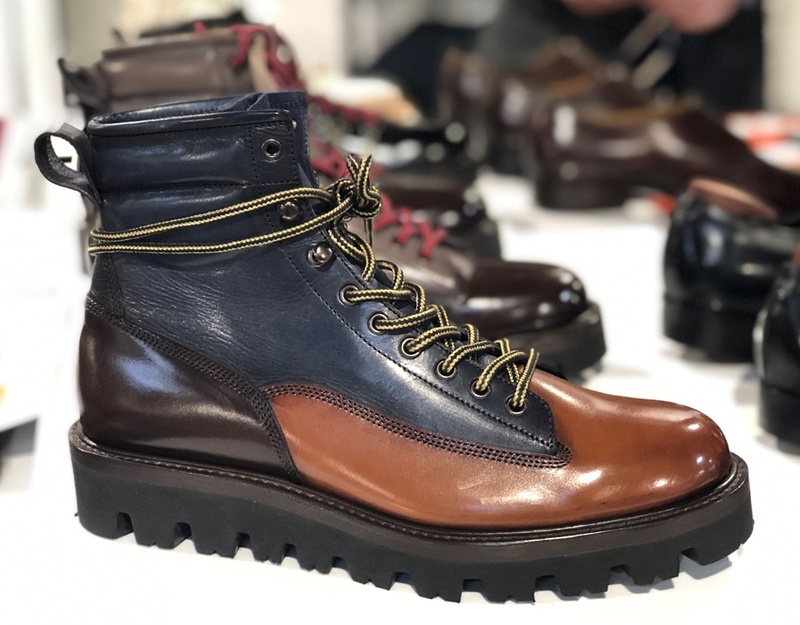 Back in the Stockholm Trunk Show in September 2018 there was one exhibitor I neglected, Heinrich Dinkelacker. For that reason I decided this year to take a closer look to what is an iconic, historic shoemaker from Budapest. Its roots date back to 1879 in Germany until moving to Budapest in 1960. One of the most important and unique features is that their shoes are fully handcrafted, apart from the welt stitching. This means that only 25 pairs of premium shoes go out of the factory per day. A braided multi-welt is a Hungarian trademark, with loads of small touches complimenting the looks. These include triple soles, brass taps and up to 168 nails. The high end models are actually hand-stitched since there is no machine that can do that. 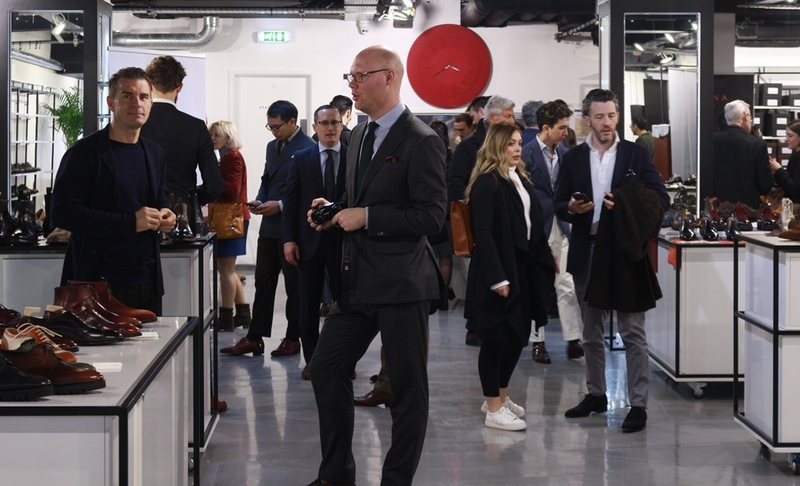 Nowadays, the Brand is a part of the Shoepassion Group, which is one of the largest stores in Germany, with a wide presence in Austria, Switzerland and even Japan. The styles vary as you can see from the pictures with classic designs and a very recognizable round toe. I look forward to testing one of these as they look very comfortable and perfect for rougher climates. Τhey are quite chunky and not everyone’s cup of tea but remind me very much of Alden. 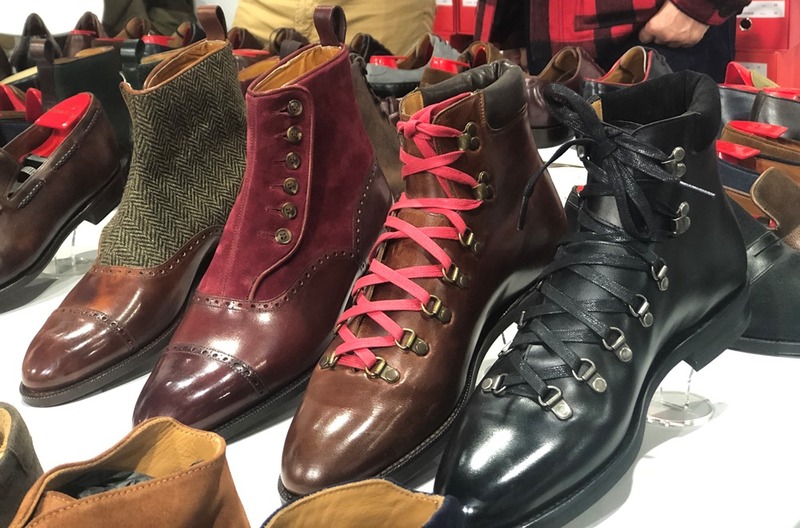 Update: You can now take a look at Shoepassion’s coverage of the event! Spot me at 2:43! Finally we get to the last exhibitors. I have mentioned Skolyx before in my under $400 Brands Guide as a pretty good value shoe retailing at about £160 ($210/€199). 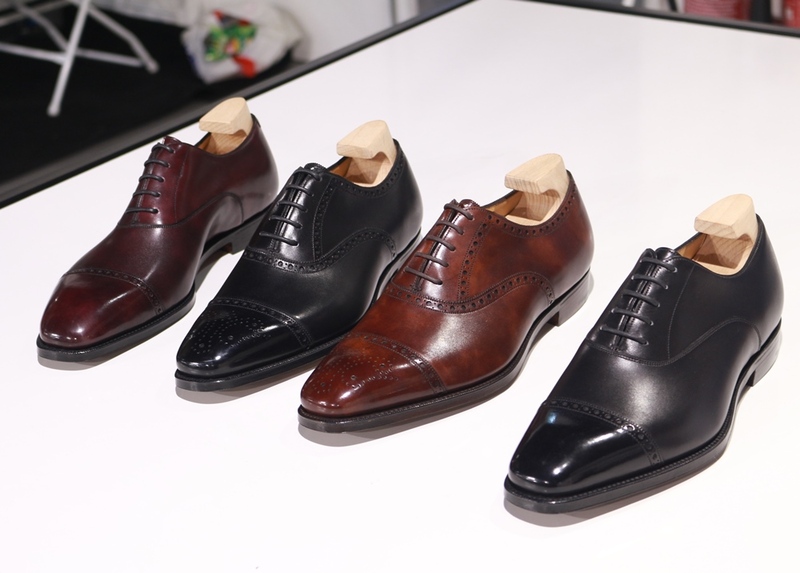 Skolyx had a few models of classic shoes with both calfskin and suede. 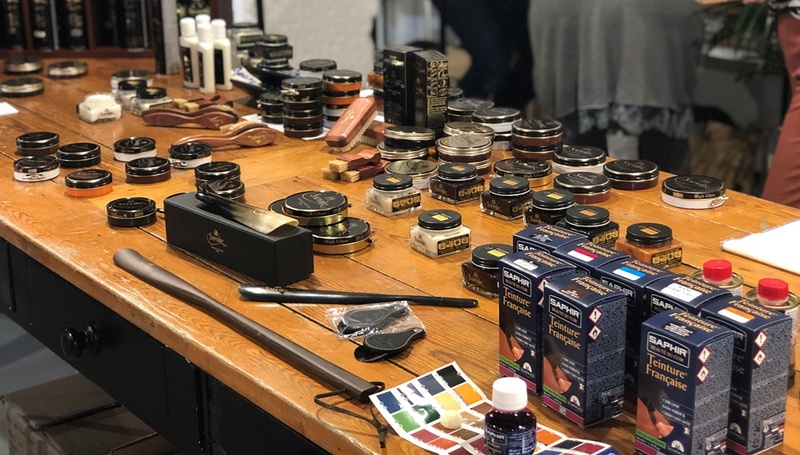 The focus though was on the pleasant surprise for me in the London Super Trunk Show 2019. That Brand is TLB Mallorca. They are just about 1 year old and bear the name of the founder, Toni Llobera Barceló. 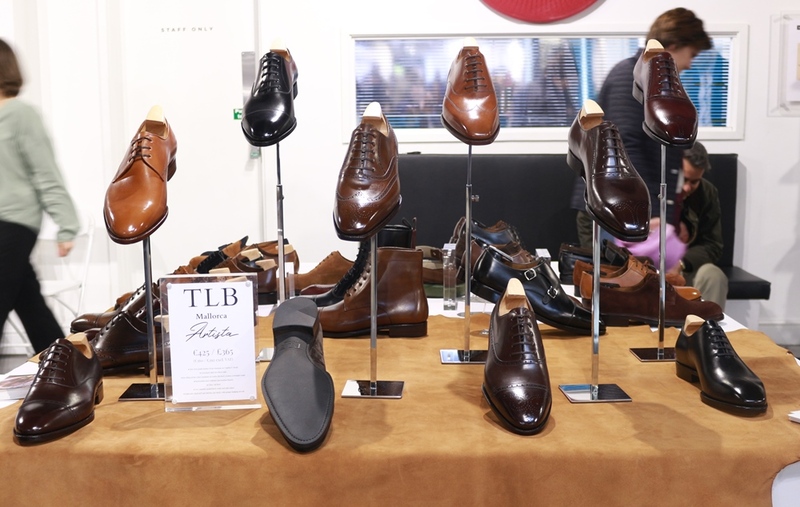 Available through their own website and the Skolyx web platform, TLB Mallorca has classic quality shoes for a great price at approximately £310 ($480/€365). You can even customize your own shoes the way you want them to be. In a great marketing move, they just revealed their Artista Collection, due to drop in May. In collaboration with Jesper Ingevaldsson of Shoegazing, they have created a spectacular shoe for the unbeatable price of £365 ($560/€425). What makes them so good? 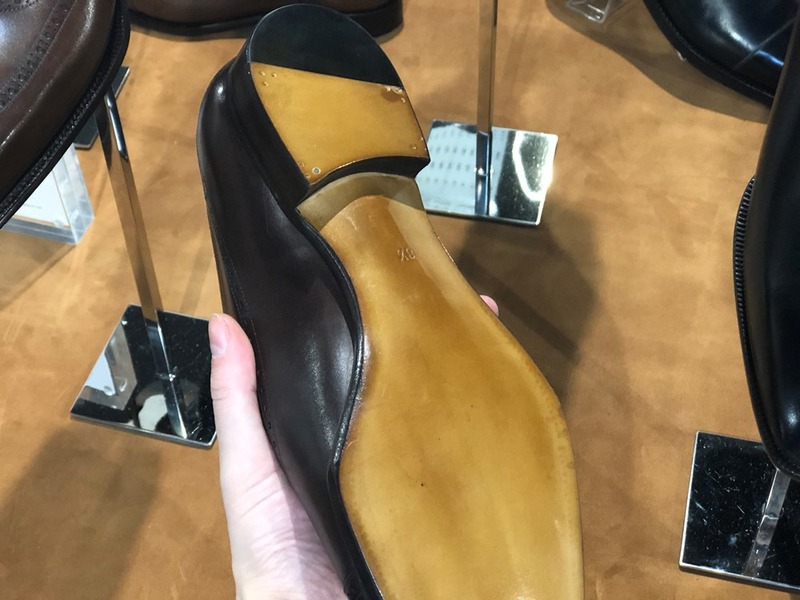 Well, I challenge you to find a RTW Shoe that is Goodyear Welted from high quality leather, with closed channel soles and fiddleback waist that is fully 270 degree welted for less than that. Which brings me to the best part of it all. Toni is such a loving character. Passionate about his shoes, starting everything from scratch and building a Brand in an age where most will go to China and India and there is so much competition out there. You do not only buy a good shoe, but you also support good people. Once more, be on the lookout for a potential review. I feel I need to get this out there so people know! Tip: For those of you in Asia, check out Yeossal who is another official retailer for TLB Mallorca. So, I had the pleasure of meeting Bojan and his wife for the first time. Not only that, they spent their entire day with me and even had the courtesy to invite me to dinner. Therefore I feel the need to add a little bonus section and share it with you all. 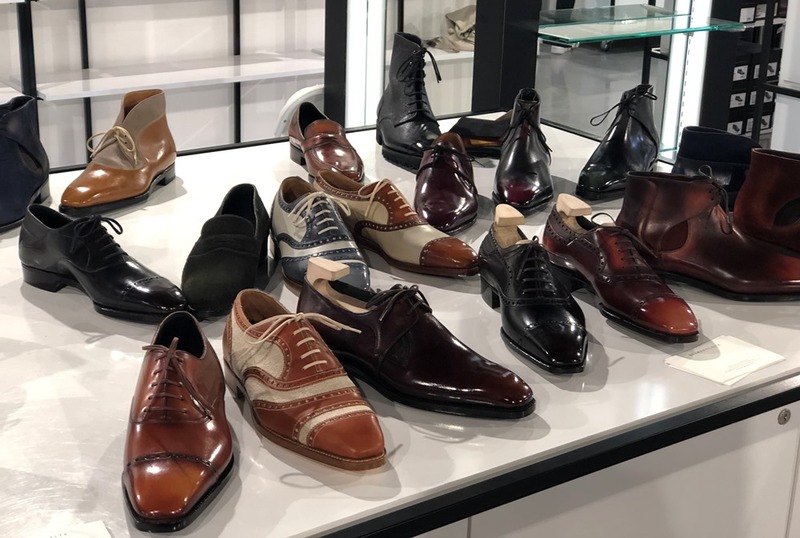 Bojan came to London to mingle, talk and see shoes, but also found the opportunity to bring some samples of his own work. 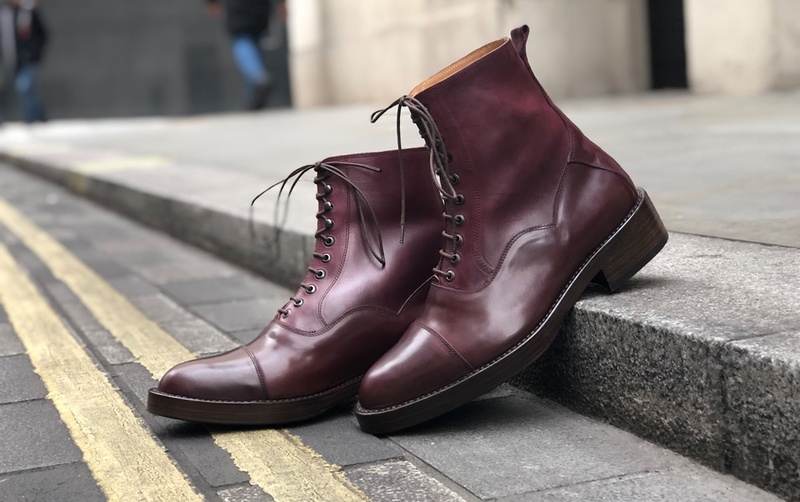 To show my gratitude, I took some pictures of a unique triple strap blue Jodhpur and a Horse Rump- Burgundy Cordovan Boot from the Maryam tannery. Please enjoy his work, it is truly something. Wow, what an experience this was! A roller-coaster of emotions, including flying for half a day to London from Stockholm just to attend this. In the process I met amazing people from all over the world, including Bojan from Zeb Shoes, Toni from TLB Mallorca and Norman Vilalta. I also learned so much more about shoes and learned to appreciate each artist’s expression and uniqueness. This is an experience of a lifetime and one that I will savor every time I can. 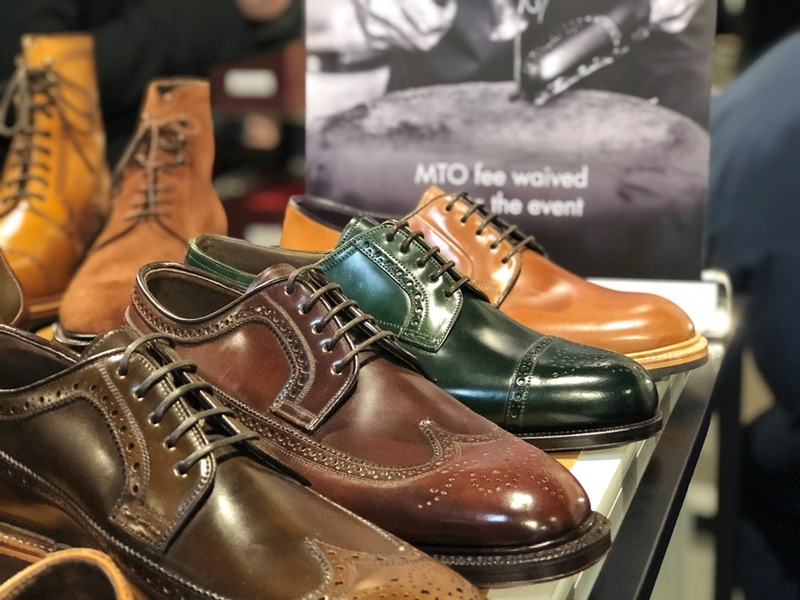 I can wholeheartedly say that the London Super Trunk Show 2019 was phenomenal and that you should all try to attend one! Next time you look at your shoes, think about the love and care some people put into it. Enjoy all the photos and I will see you next week with something special.